There is no difference. Flu is a short form used to describe influenza. The "flu" is often mistaken for the common cold as many of the symptoms are the same. However, the flu is significantly more serious than a cold. The symptoms of flu can include fever or feeling feverish with chills, cough, sore throat, runny or stuffy nose, muscle or body aches, headaches and fatigue. Cold symptoms are usually milder than the symptoms of the flu. People with colds are more likely to just have a runny or stuffy nose. The "flu" (or influenza) can result in serious associated complications such as pneumonia and bacterial infections sometimes resulting in hospitalization and death. Even though you may have avoided getting the flu so far, it does not mean that you will not get sick this year. Different strains of the flu virus circulate every year. “Getting the flu shot will give me the flu"
The vaccine does not contain live virus and cannot give you the flu. If you develop influenza within 2 weeks of receiving the flu vaccine, it is possible that you had already contracted the virus and were developing the flu at the time you were vaccinated. “Flu shots aren't worth getting because they are not very effective"
On average, the seasonal flu shot is 50-60% effective in preventing the flu in healthy adults. Although, some people who get the flu shot may still get sick, the flu tends to be milder than if they did not get the flu shot. Every year the flu shot reduces the risk of serious flu complications, eliminates thousands of visits to hospital emergency departments and prevents hundreds of deaths. Serious illness and death due to influenza is highest in people over 65. COPD patients are at an increased risk of death due to the flu. As well, people in nursing homes are particularly vulnerable. “I got the flu shot last year so I don't need to get it this year"
Immunity does not last for more than one year. The viruses that cause the flu may change slightly each year so the vaccine must also change each year to match them. 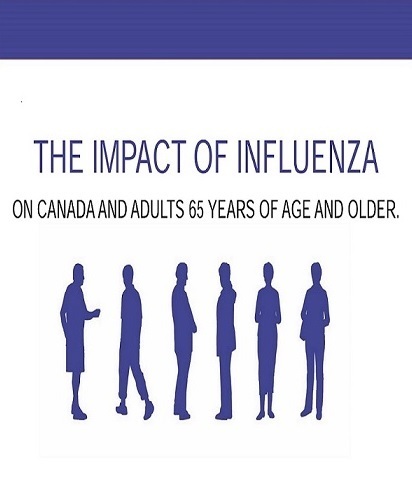 Older Canadians suffer disproportionately from flu-related morbidity and mortality. Adults 65+ represent 15% of the Canadian population. However, during influenza season they account for 70% of the hospitalizations. Complications of influenza often result in COPD exacerbations which can then trigger heart attacks and stroke. Influenza-attributed death is 12 times greater among those 65+ who also have a chronic lung disease. The National Advisory Committee on Immunization (NACI) recommends that those age 65+ receive a flu vaccine each year. New high-dose trivalent influenza vaccines, specifically for the elderly, have been introduced to Canada. A recent study concluded that the new High-Dose influenza vaccine significantly reduced hospital visits for the elderly. Currently, only Manitoba provides free access to these high-dose flu vaccines specifically for nursing home residents - who have the greatest mortality risk from influenza of all Canadians.